Don’t we all just love Laura? From her Pioneer roots Laura grew up to be inspiring both in life and in death. Read my posts below to learn more about her amazing life. Start here to read a general overview of Laura’s life. Laying poetry down Laura Ingalls Wilder style. De Smet Musings. Going back to the Little Town on the Prairie but not for braces like that one time. Have a toe-tapping good time with the Music of the Little House. Pa Knows Best. Collected wisdom from the Ingalls family patriarch. Imagining Mary with Claire Danes’ Little Women cry face. Reflections on The Long Winter. Some reflections on Little Town on the Prairie. Bombing main prairie style. Reflections on These Happy Golden Years. When the story gets sad in The First Four Years. An account of the Wilder family’s move to Missouri in On the Way Home. A collection of Laura’s pre-Little House writing in The Little House Reader. 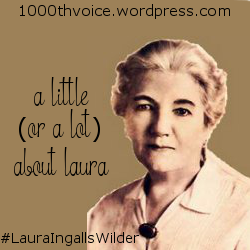 Finding Laura world in The Wilder Life. An interview with Wendy McClure.